Masala chapathi is similar to aloo paratha. This was my favourite item growing up. Its filling is similar to “Batate Ambade” that is made in konkani homes of Mangalore. This was usually made during fasting time as it did not contain onion or garlic. I always thought that this was aloo paratha until my best friend Harusha introduced me to North Indian Style Aloo Paratha. Now I make both of them frequently. 1)Boil potatoes and mash it. 2)Add salt and hing water.Mix well. 3)Heat oil. Add mustard when they splutter add urad dal fry until golden. Add chopped green chillis and fry for a while. Add this to the potato mixture. 4)Add chopped coriander leaves and mix. Check for salt. 5)Make chapati dough with ingredients mentioned for outer cover. 6)Take a small ball of dough and roll it into small discs (poori). Put some some filling in the centre of the poori and cover the filling as done for aloo paratha sealing the edges well. 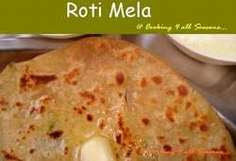 7)Roll it into paratha applying wheat flour as needed. 8)Heat a griddle and fry until brown on both sides using ghee or butter. The aroma of hing and coriander leaves fills the kitchen. 9)Serve hot with coriander chutney or tomato ketchup. Tastes well as it is also. P.S: Amma used to add even grated Coconut to enhance the taste. Also some chopped curry leaves was used in the tadka. I skipped them as I was not having it. If the filling is leftover then make a batter with Besan(chickpea flour)+ salt + Chilli powder of medium consistency. Make small balls of filling. Roll it into the batter and deep fry it in oil on medium flame. This makes it Batate ambado. The filling can be refridgerated for 1-2 days. Song a konakani dish is usually made very spicy. We love spicy food so Amma made a variety of songs with Potato(Batate song),Green Peas(Dried batani song),tender cashews(Bibbe song),Cauliflower, and okra(Benda Song). My hubby too is fond of spicy food so one of these songs happen to make their appearance in our kitchen frequently. After marriage my mom in law(refer to her also as amma) introduced me to one more variety of song made from Breadfruit(Jeevkadgi song). Song with White rice and Daalithoy is always a hit at our place. We also make a spicy dish called Batate Vaagu the recipe will be soon posted. Song also tastes great with chapathi or dosas. My mhaav – Jayanthi mhaav(amma's elder sister) who is a wonderful cook makes this well. She usually made this with Shevai(Rice noodles) and i used to skip my meals just to have this all three times a day. We never had problem with our choice of food while growing up as my mhaavs stayed close by. Vidya mhaav stayed in the same building and Jayanthi mhaav stayed at a walkable distance from our place. When i would notice any food that was not of my choice I would check with my mhaav's as to what was cooking in their kitchen, and if they had something of my choice then it would be sent to me ;). Food was always exchanged between the houses depending on our liking. Now far away from all of them i miss everyone's cooking. So trying to recreate those dishes in my kitchen. 1 Cauliflower broken into bite sized florets and soaked in water with salt and pinch of turmeric powder for 15 mins. 1)Heat oil and add mustard when it splutters add chopped onions and little salt. Fry until they turn brownish. 2)Add chopped tomatoes and cook until mushy. 3)Add crushed corainder seeds and other powders and fry for sometime. 4)Add tamarind juice and stir well. 5)Add chopped cauliflower,salt and water.cook covered until done on medium flame. 6)Garnish with chopped coriander leaves. Serve hot with chapathi or as a side dish for rice. Valval is a very famous Konkani(Amchi curry) that has a mild taste and very pleasant aroma. It is also called Yogirathna. My ajja(Grandfather) used to say that it was called yogirathna because it was fit for yogis as they never ate anything spicy. Spice was supposed to induce anger in a person so yogis never ate spicy food.When I was a kid I used to hate valval and everyone at home loved it. But when I started going to college amma was transferred to Bangalore. I, dad and my Bappi(my dad's younger brother actually bappa but I call him bappi, was staying with us then) used to manage cooking. It was then that I started missing this curry. Amma used to come home on second saturday of every month. We used to eagerly wait for her to come home. The day she reached home we made only breakfast & rest of the duties were left to her. Poor amma never got rest. Valval was usually on top of our list on those days. After eating this we usually felt drowsy because of the coconut milk and everyone used to take a big nap ;). Annu used to ask later that day, if any one had eastman colour dreams as coconut milk used to cause pittha. Anyways, growing up I have loved this curry a lot and also with ready-made coconut milk it hardly takes anytime if you have the vegetables ready. I would like it to be my very first post on this blog. 1/4 cup thick coconut milk diluted with water as required to boil the veggies. 1)Boil the veggies + green chilies + cashews with diluted coconut milk without using cooker. I added ash gourd and pumpkin at last i.e after rest of the vegetables were 3/4th done as it gets boiled easily.The veggies should not be over cooked it should retain their shape. 2)When veggies are boiled add salt and coconut milk. Give it a good boil takes around 7-8 mins and switch off the gas. 3)Heat oil in a seasoning pan and add cumin seeds. When they start spluttering and curry leaves and let it for a while. Remove it from flame and add it to the curry. There are a lot of variations in making valval but this was how my amma used to make it. PS: If using coconut milk that is extracted at home my amma used to grind 1 tbsp of white rice soaked in water for some time. This was to give thickness to the curry. This is added after the coconut milk is added.But I omitted this as I used very thick coconut milk.